Did Transocean's Neglect of Deepwater Horizon Rig Maintenance Cause Gulf Oil Spill? 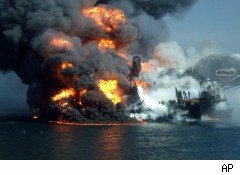 Transocean's (RIG) Deepwater Horizon offshore oil rig exploded in the Gulf of Mexico more than four months ago, killing 11 of its crew and injuring 17. But the investigation into what happened on April 20 and the events that led up to it is just beginning. So far, BP (BP) has taken the brunt of the blame and public wrath over the explosion and the oil spill that followed, but the investigation is now focusing on Transocean's maintenance of the rig. A key instrument failed during Macondo well blowout, causing the worst oil spill in U.S. history. The investigation is also looking at Halliburton (HAL), which was the contractor for the cement job, and the federal Minerals Management Service. When Transocean, BP and Halliburton employees testified at an inquiry into the well explosion by the U.S. Coast Guard and the Bureau of Ocean Energy Management, many tried to pin blame for the accident on each other. But some pointed the finger directly at their own employers. The Financial Times reports that one Transocean employee said Transocean failed to comply with recertification maintenance rules for the Deepwater Horizon's blowout preventer: According to his testimony, the rig's blowout preventer, designed to shut off the well in case of an emergency, was four years overdue for major maintenance. When the accident occurred, the blowout preventer failed to work, which led directly to the massive oil spill. Transocean claims the Deepwater Horizon's blowout preventer underwent extensive inspections and maintenance on a regular basis, including an inspection that morning. But a BP exec told the panel the blowout preventer had been modified in 2004 and 2005, which made early efforts to shut the well down ineffective, because its plumbing was different from what the response team had on its books, an assertion Transocean refutes. The Washington Post adds testimony from Tuesday by a Halliburton employee who said he told BP engineers that if BP proceeded with the cement job as designed, it would have a gas-flow problem. He recommended a possible solution which BP chose not to use, he said. BP, of course, said Halliburton should have refused to do the job. The Wall Street Journal adds that on the morning of the explosion, BP sent the rig employees a request for a change in a key safety pressure test. That request, the newspaper said, was "unorthodox and left crew members confused." BP wanted to remove an unusually large amount of the thick, heavy fluid called drilling mud from the well and set the cement plug much deeper than usual before running the pressure test. The drilling mud holds down any gas that leaks into the well. But key BP and Transocean managers were unavailable to consult employees on the rig before and during the test. The rig manager himself was on shore.